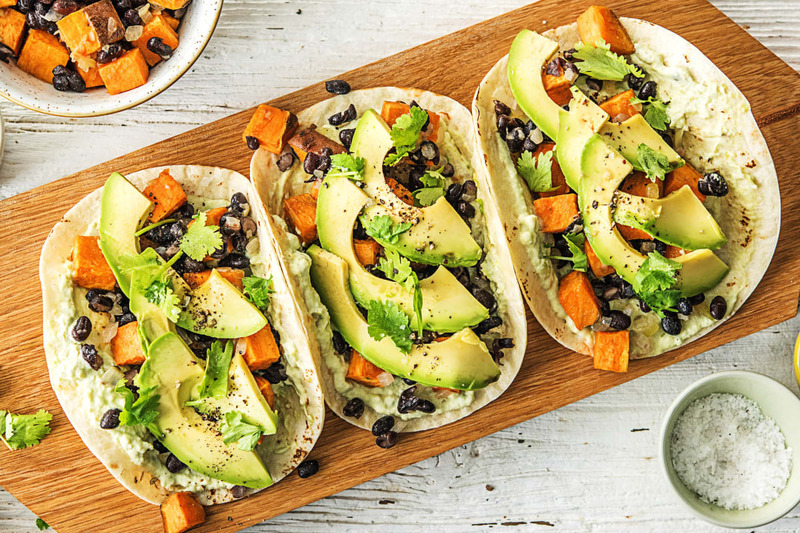 Not many tacos can boast that they’re rich in vitamin A. Ours, however, are full of it, thanks to tender roasted cubes of sweet potato. 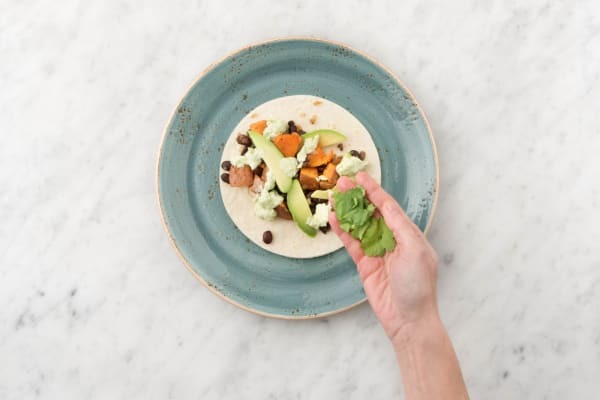 They’re joined by black beans and a zesty avocado crema for some of the most delectable veggie goodness to be found inside the fold of a tortilla. You could say that they bring their A-game in every single way. Wash and dry all produce. Adjust rack to middle position and preheat oven to 400 degrees. 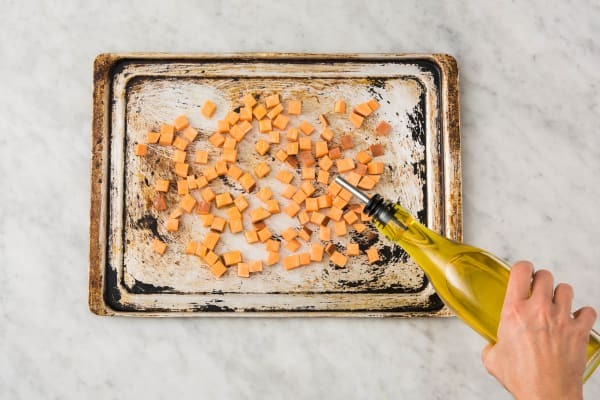 Cut sweet potatoes into ½-inch cubes. Toss on a baking sheet with 1 TBSP olive oil and a pinch of salt and pepper. Roast in oven until tender and lightly browned, about 20 minutes. Meanwhile, halve, peel, and dice onion. 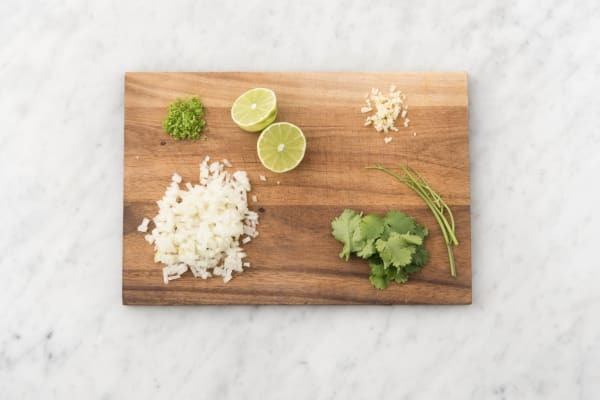 Pick cilantro leaves from stems; discard stems. Mince or grate garlic. Drain and rinse half the beans from the box (use the rest as you like). Zest ½ tsp zest from lime, then cut into halves. Heat 1 TBSP olive oil in a large pan over medium heat. Add onion and cook, tossing occasionally, until softened, 5-6 minutes. Season with salt and pepper. 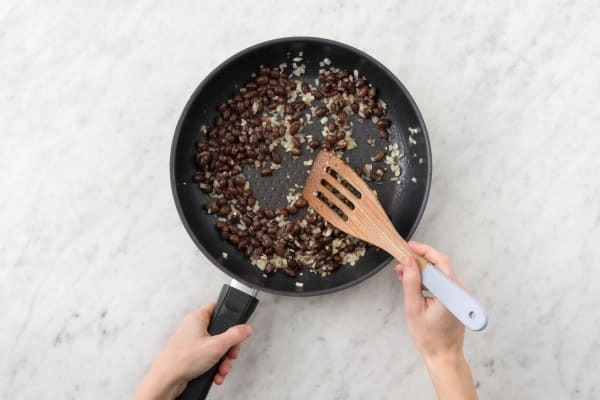 Add garlic and beans to pan. Cook, tossing, until fragrant and warmed through, 3-4 minutes. Wrap tortillas in foil and place in oven to warm, about 5 minutes. (TIP: Alternatively, wrap tortillas in a damp paper towel and microwave on high until warm, about 30 seconds.) 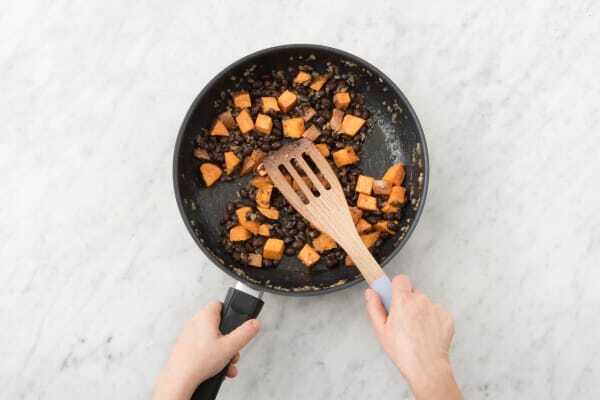 Toss sweet potatoes, honey, cumin, and juice from one lime half into pan with beans and cook until liquid is mostly evaporated, 2-3 minutes. Season with salt and pepper. Halve, pit, and peel avocado. Cut one half into thin slices. Roughly chop other half and place in a medium bowl along with sour cream, juice from remaining lime half, and lime zest. Mash with a fork until mostly smooth. Season with salt and pepper. 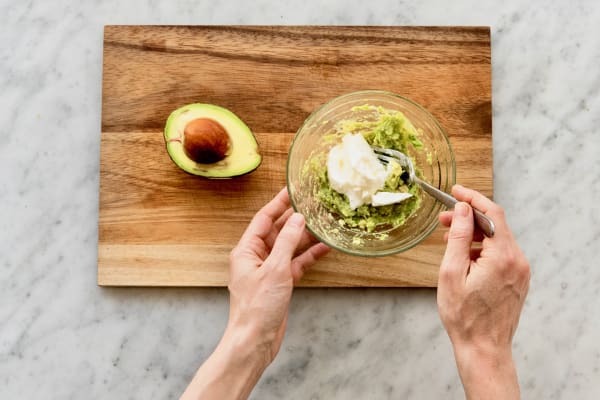 Spread avocado crema onto tortillas, then top each with filling, avocado slices, and cilantro. TIP: Break out the hot sauce if you like it spicy.